Tour de France 2010 winner Andy Schleck (Trek Factory Racing) confirmed during a press conference on Thursday morning that he will retire from professional cycling. The 29-year-old from Luxembourg has said that a persistent knee injury has ruled out his continuation at the top-level of the sport, and he retires after nine years as a professional. 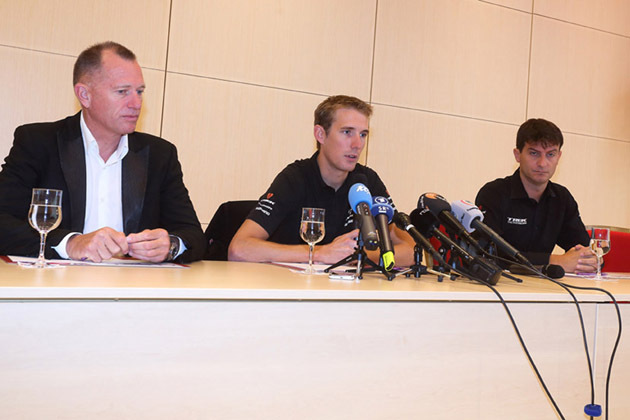 Andy Schleck pictured at the Press Conference to announce his retirement. Schleck did not reveal what he would do next, but hinted at staying in the world of cycling. Aside from his 2010 Tour de France title, which he ‘inherited’ when Alberto Contador was stripped of the title for testing positive for clenbuterol, Schleck’s other major victories include Liege-Bastogne-Liege in 2009 and stage 18 of the 2011 Tour de France. Since 2011, Schleck has not won a race, suffering from a series of injuries and crashes.